We’re seeing the entrepreneurial spirit emerge in bedrooms and garages again today. Bitcoin miners are strapping together motherboards and graphics cards, up-ending the way we think about currency, and throwing wrenches into systems—both figuratively and literally. It hearkens back to the nascent PC boom that started in the 1970s. It started in West Coast garages, tracing a path down I-5 from Seattle, down through the burgeoning Silicon Valley semiconductor scene, all the way south to Los Angeles. Here’s a look at some of the most successful pioneers whose household names got their start out in the garage. Forbes calls Belkin founder and CEO Chet Pipkin the “wealthiest tech entrepreneur you’ve never heard of.” That’s fine by him. Pipkin would rather be known outside of his brands (Belkin, Linksys, Wemo, Phyn) for his community activism, which includes crime prevention initiatives, reading programs, and breast cancer research. He launched the company in 1983 in his parents’ garage in Hawthorne, CA, a coastal city near Los Angeles. PC magnate Michael Dell got his start as a 19-year-old in a University of Texas residence hall, a room located on the top floor of the 27-story Dobie Center. He started the company with $1,000 and built custom PCs from parts. His first windfall came when he started selling into state government—one of many astute business moves that would grow Dell Technologies into a full-stack juggernaut. William Hewlett & David Packard, HP Inc.
You might say Silicon Valley was born in the famous garage located at 367 Addison Avenue in Palo Alto, CA. That’s where William Hewlett and David Packard pioneered stable audio oscillation for radio circuitry in the 1940s. HP entered the computer market in 1966 with the first device to be called a personal computer, HP 2100 / HP 1000, the first in a long line of successful business computers. Up the road from HP’s Palo Alto garage, the Homebrew Computer Club met in a Menlo Park garage starting in 1975, and provided a breeding ground for several heavy hitters in personal computing. The photo above is courtesy of Bob Lash, a Homebrew member who went on to invent dozens of computerized medical devices. Homebrew’s roster reads like a who’s who of modern PCs. Steve Wozniak developed the first two Apple computers; he and Steve Jobs met as teenagers working at HP. 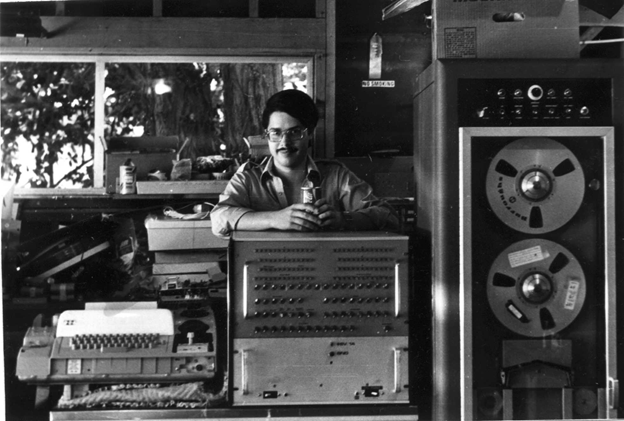 Jobs and Wozniak didn’t alert the media when they invested what would become most successful microcomputer of the first wave of PCs; they shared it with their Homebrew soulmates. Later, Apple Computer incorporated in Jobs’ childhood home in nearby Los Altos (below left). The MITS Altair 8800 minicomputer hobbyist kit (1974, above right) provided the hardware framework for much of the tinkering happening at Homebrew. Two young computer scientists, Paul Allen (now the owner of the Seattle Seahawks) and Bill Gates, wrote the high level software language that operated the circuitry for the Altair 8800. Altair BASIC became the foundational product for Microsoft, the preeminent operating system maker for modern computing. It started in West Coast garages, tracing a path down I-5 from Seattle, down through the burgeoning Silicon Valley semiconductor scene, all the way south to Los Angeles.